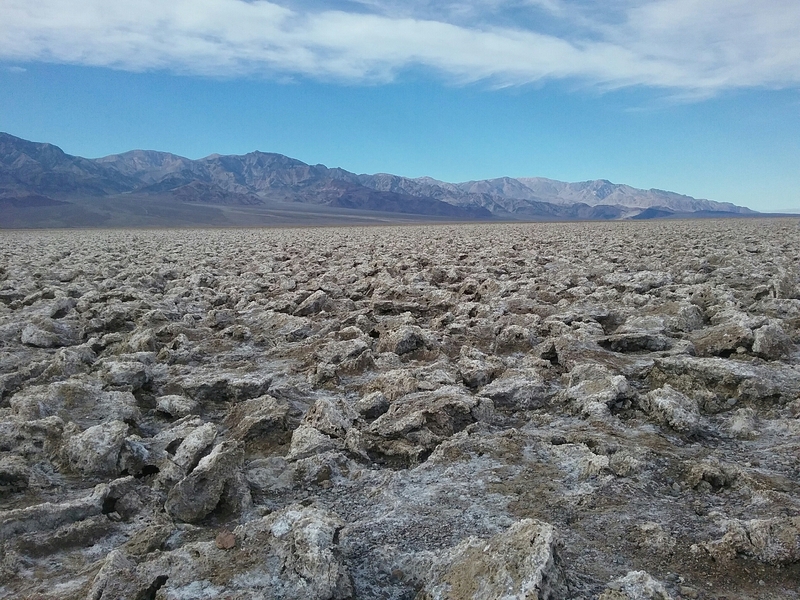 This is a very unique spot on the way towards Badwater_Basin. All those chunks you see on the ground are salt. Salt that goes 20 feet deep. 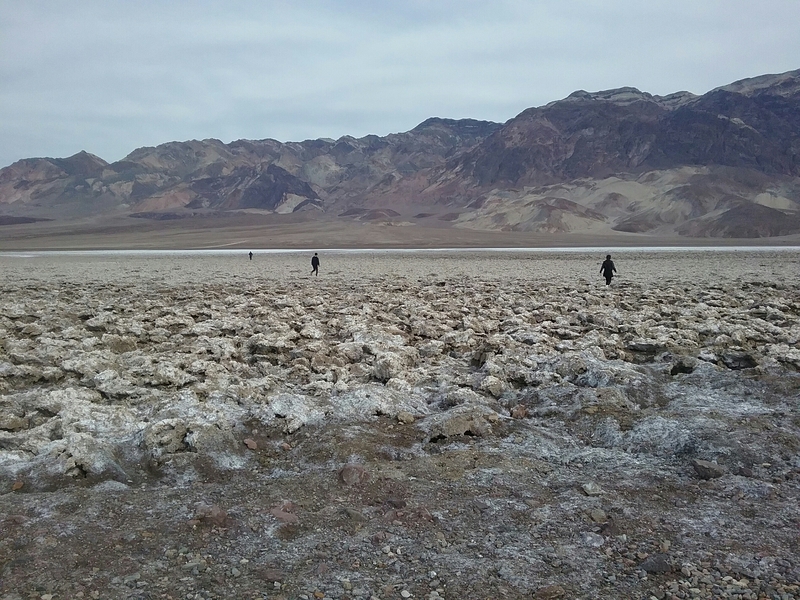 Now Badwater_Basin also has salt covering the ground but nothing like this. Not sure if anyone has tried to replace their table salt with the salt found here. Who knows, even though this salt is dirty it might actually be better for you. (Can you see the snow on top of the mountain). 60 degrees outside when I took this shot and I still see snow. Gotta love Mother Nature. In this picture, an international family was trying to get their dog to come back to them. I assume the dog had been riding a long time in the car and was just happy to be free. It was running all over the salt chunks on the ground. I did not stay long enough to see what it’s paws looked like when the dog was done exploring. The first time I came out here, with Robert, I walked for a ways out onto the salt. I was a bit surprised that the ground was so hard. I guess I expected it to be more spongy. A little closer look at the ground and you can see that there would be no way to play golf here…unless of course you really were the devil. 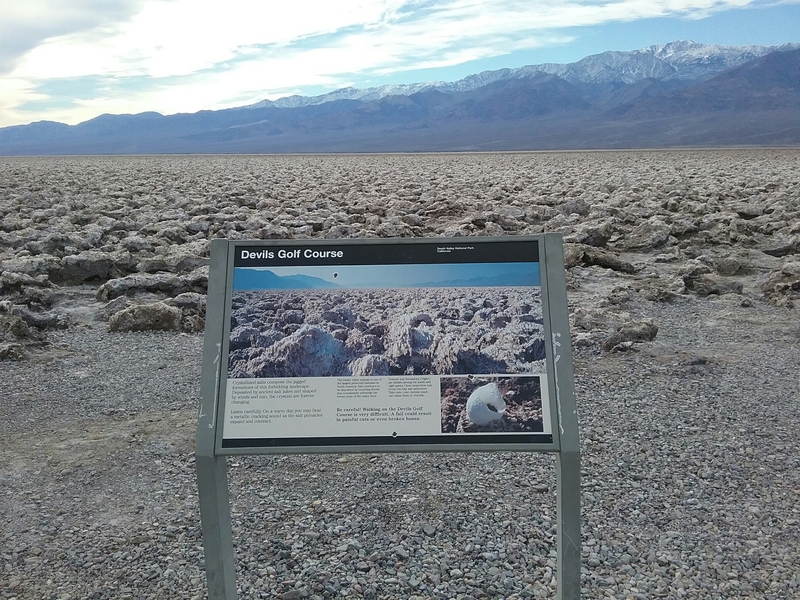 Yes whoever named this spot in Death Valley had a sense of humor. I love the view of all the mountains around this area. I was standing near the same spot that I took the first picture above…just looking the opposite direction.